Coca Cola’s much-awarded ‘Share a Coke’ campaign has reversed a decade-long decline in Coke sales in the US, The Wall Street Journal is reporting. The company’s US sales have risen 2.5% since it rolled out the ‘Share a Coke’ campaign, which began in Australia in 2012 with Ogilvy Sydney. While The Coca-Cola Company will release official figures in late October, the WSJ has reported that Nielsen store-scanner data found Coke sales in the US rose 0.4% for the 12 weeks through August compared with the same period a year ago. The soft drink giant’s sales had been falling for 11 years in a row prior to the campaign. The ‘Share a Coke’ inaugural season in Australia in 2011 was the brand’s most successful summer ever, with young adult consumption up 7%. The campaign aimed to get people talking about Coke and actually consuming the product over summer, on top of simply loving the brand. Coca-Cola printed 150 of Australia’s most popular names on labels of Coke bottles, encouraging consumers to ‘Share a Coke’ with someone to connect and share the experience. About 80 countries have since taken on the ‘Share a Coke’ campaign. In the US, the company printed 250 of the most popular names among teens and millennials onto Coke bottles. Ebay is buzzing with reselling of the limited-edition bottles, including mark-ups such as $13.66 for ‘Spencer’ (US) and $12.94 for ‘Eric’ (UK). 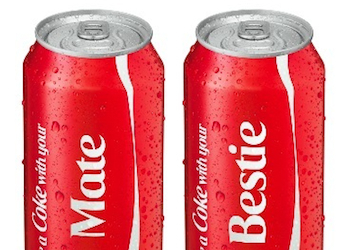 A 10-set of cans from Australia selling for $25 includes the whole set of titles – ‘Mum’, ‘Sis’, ‘Boss’, ‘Dad’, ‘Pop’, ‘Champ’, ‘Bro’, ‘Nan’, ‘Mate’ and ‘Bestie’. Coke senior brand manager in the US Evan Holod said the company would give “serious consideration” to bringing the ‘Share a Coke’ campaign back to the US next year, according to WSJ.